Learn how we’re working to keep the Clackamas River clean. Trash on the river is a drag! The Clackamas River is one of the few easily accessed recreational rivers in the Portland-metro region. The mainstem Clackamas River has seen an exponential rise in recreational use over the last decade, which has unfortunately corresponded in an increase in litter left behind by these users. Preventing this trash from entering the river is of utmost importance: the Clackamas provides drinking water for over 400,000 people, supports the last significant run of wild late-run Coho in the Columbia basin, and is home to one of only two remaining runs of spring Chinook in the Willamette basin. Trash isn’t good for salmon, drinking water, or recreational users — the Stash the Trash program helps to protect all of those groups. In fact, we credit the Stash the Trash program with a significant reduction seen in trash along the river. Each summer, 6,000 Stash the Trash bags are distributed at Carver Boat Ramp, Barton Country Store, Barton Park, Riverside Park, and Milo McIver State Park. Our annual Down the River Clean Up event in partnership with WE LOVE CLEAN RIVERS, has seen a decrease in the amount of tons of trash removed per year, down from a high of 4.29 tons of trash removed in 2006 to 2.5 tons removed in 2018. 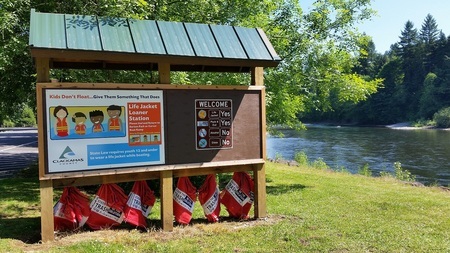 Interviews with river users and Park Rangers give anecdotal evidence that the bags are being used, and staff often find empty stands while they replace the bags — which occurs twice per week between Memorial Day and Labor Day. Many recreationists take bags along when they launch — peer modeling “best practices” by using the bags themselves, offering them to other paddlers, and using the bags to clean up after others. Anglers on the Willamette River have been seen using our bags too! Contact us if you’d like to become a sponsor of Stash the Trash — business and community partners will have their logos displayed on the bags, which are distributed at Carver Boat Ramp, Barton Country Store, Barton Park, Riverside Park, and Milo McIver State Park. 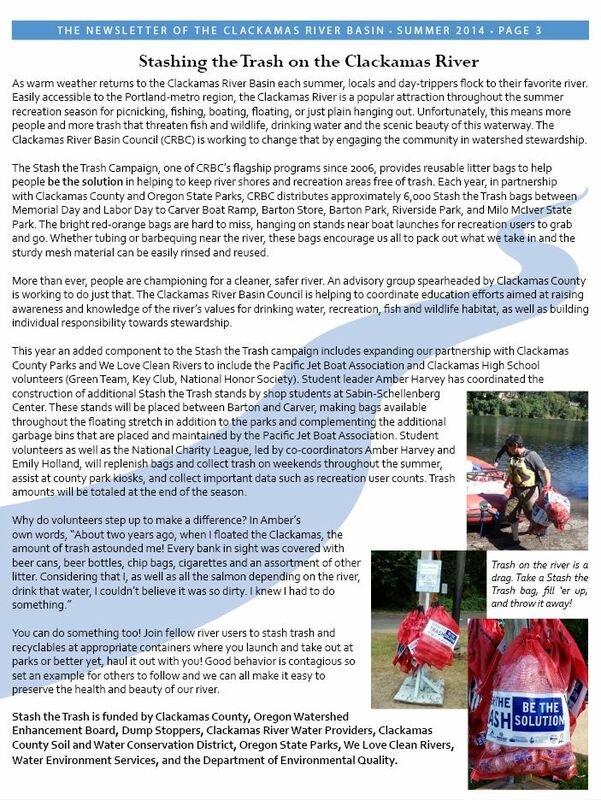 Stash the Trash is funded by Clackamas County Water Environment Services, Dump Stoppers, Clackamas River Water Providers, Clackamas Soil and Water Conservation District, Oregon State Parks, Warn Industries and We Love Clean Rivers. THANK YOU!